Berkeley Condemned Killing Dogs. It's Only a Matter of Time for Fish, Chickens, and Pigs. I never really cared that much about dog meat. Everyone would get up in arms about it as my Asian American family tried our best to distance ourselves from it, insisting it’s only a small population that eats dog meat. I never felt the deep-seated disgust towards it many Americans feel. At first it was because I thought it was ok for everyone to eat what they wanted to. Now, as part of the first group to successfully infiltrate the dog farms of Yulin, I feel that way for a very different reason. 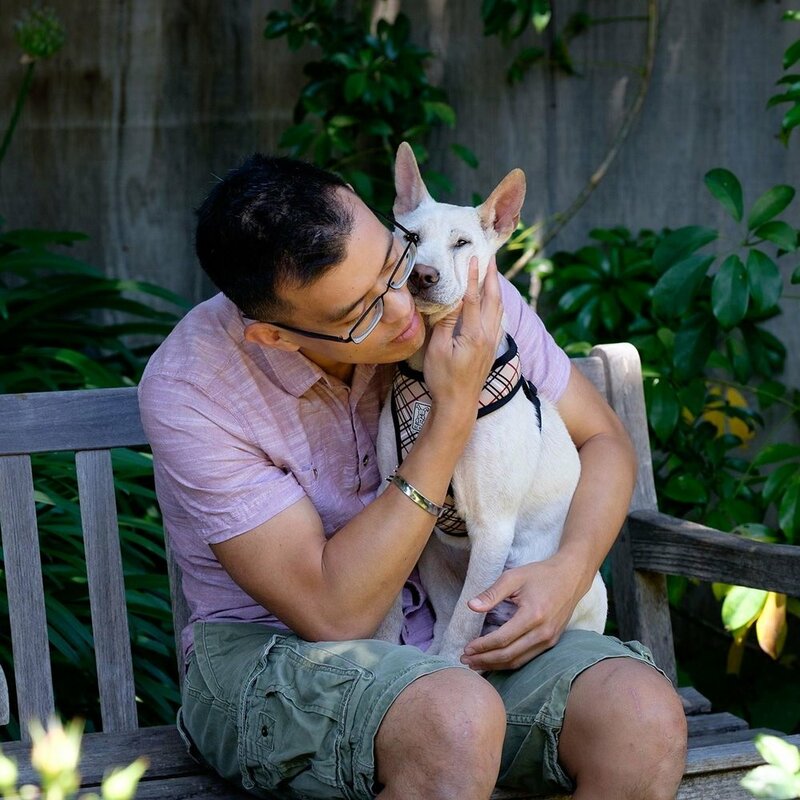 Rescuer Wayne Hsiung with Oliver, a dog rescued from a farm in Yulin, China. Last Tuesday, the Berkeley City Council passed a resolution condemning the dog meat trade in Yulin, China and committing the city council to oppose animal abuse more generally. This follows a DxE investigation on ABC’s Nightline led by Berkeley activists representing first-ever successful infiltration of the dog meat farms of Yulin. Ordinarily these investigations attract accusations of imperialism, but this time was different: the team was led by a Chinese American working in tandem with Chinese activists who had sought our support. As a Chinese American, this has made me ask myself why we are singled out for something so similar to what happens in the U.S. Over 10,000 dogs are slaughtered at this annual festival, with 10 to 20 billion dogs slaughtered for their meat altogether. 9 billion land animals suffer the same fate in the US alone. My friends have been inside the facilities where these 9 billion are raised, too, and the similarities are striking. In fact, the investigation found that the dog farm investigated was actually a retrofitted pig farm. Americans often respond to the gruesome footage of animal farms by supporting better treatment for farmed animals. An increasing share of the American meat market goes to natural and organic foods. Yet nobody reacts to the horrors of Yulin by calling for free range, organic, or higher welfare dog meat. When Americans see dogs being killed, they want it to end for good. What does this say about our attitudes toward animals here? What does it say about our movement that we fight for an end to the raising and killing of dogs but only small improvements in the raising and killing of other animals? Rescuer Diane Sorbi with Helen, a hen rescued from Diestel Turkey Ranch. The way that Yulin locals snarkily reply to Americans upset over dog meat provides an unflattering reflection of American attitudes. Yulin locals generally reply that “I’m not forcing them to eat dog, so they can't force me to stop.” “We grew up around dog meat. For us, it’s normal.” In fact, British psychologists have found that we offer the same justifications for eating other animals: it is nice, normal, necessary, and natural. So when the Yulin dog meat festival comes around each year, people who eat animals but love dogs are thrust into the position of animal rights activists. Tuesday night, the Berkeley City Council made clear that it loves dogs and has been thrust into the position of an animal rights activist with a resolution condemning dog meat and all animal abuse. Now, my fellow Asian American activists and I who advocated for this bill wait for the Berkeley City Council and - one day - all governments to make the connection between the killing of dogs the killing of fish, chickens, and pigs.